Evan hails from the small town of Averill Park, NY, and has been playing drums for roughly 8 years. Before deciding on the drums, Evan was exposed to and learned how to play a number of instruments at a formulative age, among them guitar, trumpet, tuba, clarinet, bass, and piano. He played in rock, blues, and top-40 bands all thoughout high school, and was selected to attend the Skidmore Jazz Institute in the summer of his Junior year. While at the famed institute, he met and studied with, among others, 'Tonight Show' drummer Ed Shaugnessy. He decided soon thereafter to focus on learning jazz and latin music. Upon graduating high school, Evan enrolled at the University of Louisville, to persue a degree in Jazz Performance and minor in English. 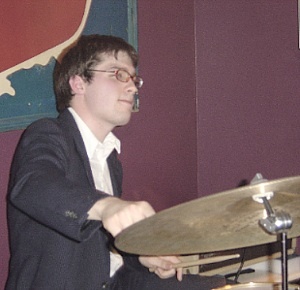 He has studied under drummers Art Berenstein, Matt Cremisio, Steve Davis, Terry O'Mahoney, and Jason Tiemann. Evan has shared the stage with jazz luminaries Delfeayo, Wynton, and Ellis Marsalis, Jamey Aebersold, Vince DiMartino, Grey Mayfield, Jim Lewis, and Gail Wynters. He has played in and recorded with such groups as Paradigm, the Matt Lawson Quintet, The Louisville Jazz Project, Suzannah Martin's "Beleza", the dixieland group 'West Market Street Stompers', as well as more pop-oriented projects such as Absorb/Dissolve, the Tara Kimes Trio, and Chumley. Evan has performed in nearly every major venue in Louisville. A versatile, sensitive, and dynamic drummer, Evan draws influence from such greats as Roy Haynes, Bill Stewart, Jeff Hamilton, Ed Shaugnessy, Philly Joe Jones, Max Roach, Jimmy Cobb, Tony Williams, Cindy Blackman, Arthur Taylor, and many others. When not playing or studying, Evan can be found teaching, writing, or reading. Look for Evan's new cd Coming very soon with the Funk Band "Paradigm"